Depending on where you look, you can often find an ant hill or two as you walk along. 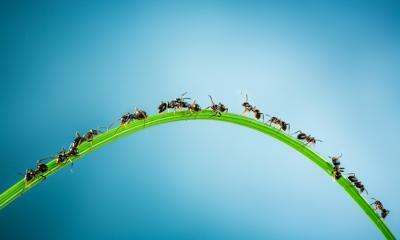 As those ants toil tirelessly away, new research shows their work has incredible extra benefits too. That research from China finds ants help increase the level of air and water flow in soil, along with the amount of organic matter. That is good for the earth and ultimately good for farmers as it positively impacts the soil where ants are busily working. For their part, community banks sometimes feel like ants in the great big world of the top 5 banks lumbering along hundreds and thousands of times larger. That said, whether an ant or something larger, the recent quarter-point bump in interest rates by the Fed was no doubt good news to all bankers. This is particularly true for community bankers that have been struggling to make money under persistently low interest rates. But how much difference that small increase makes, remains to be seen. Indeed, the search for higher returns by community banks since the crisis has raised a red flag for regulators. This is tagged as a strategic risk in the OCC's Semiannual Risk Perspective. So much so, in fact, that the OCC singled out strategic risk as an area of special concern for community banks. The report is based on statistics through the first half of 2016. Since then, the Fed has raised interest rates twice, with a 25bp increase last December and another in March of this year. Those actions are outside the time frame used for its report, so you might need to adjust slightly. The OCC pointed out in this report that before those hikes, banks with assets under $1B appeared to be the most pinched by low rates. While bigger banks have more diversified income streams to make up for low rates, community banks have fewer options. The data shows that community banks were the most dependent on net interest margin (NIM) to drive earnings. That being said, despite being tied to NIM, community banks were still outperforming bigger banks in the latest report (posting the strongest return on equity). We wanted to find out more, so we dug a little deeper. Part of the answer is that community banks, like larger banks, have seen more loan volume. However, the OCC cautions that the effort to boost business by increasing loan volume was only part of the story. They also noted that community banks were considering strategic changes to business methods and operations in response to competitive challenges. This last factor, along with a low NIM, has pushed some community banks to consider riskier strategies. Upcoming reports should shed light on how the pressure to move into riskier strategies plays out, and whether some community banks have made strategic decisions that prove costly. The strategic decisions bankers make could mean significant changes to the traditional business model. This in turn could result in higher credit and liquidity risk for example. Another area some might consider is around potentially being pushed into ill-advised mergers by the pressure to take bold strategic action. As community bankers know, ill-advised anything can be as painful as falling down in front of a line of army ants on the march, so care should be exercised. The good news is that rates are rising and that helps margin-reliant community banks. While the boost in interest rates should relieve some of the misery of low or negative NIM, it does not affect the competitive challenges facing community banks, so more work will be needed. As you toil away in your banking garden today, our advice is to remain vigilant in assessing strategic risks as you go forward, as you eagerly embrace each Fed rate hike. Markets closed due to Good Friday. Wells Fargo said it plans to close 200 branches per year for the next 2Ys, as it seeks to reduce expenses. The bank closed 39 branches in Q1. Research by Crowe Horwath finds some of the challenges companies see in managing third party risk include: lack of technology to help manage workflow and reporting (44%), limited or no participation in the third party program (44%), inability to hire and retain competent staff (34%) and inability to identify and catalog third party relationships (32%). Fed research on small businesses finds 61% of employer firms faced financial challenges in 2016 (the percentage for firms with <$1mm in revenues was 67%). In response, owners used personal funds to fill gaps (76%), took on additional debt (44%), made a late payment (44%), downsized staff, hours or operations (43%) and negotiated terms with lender (21%). Research by Javelin Strategy finds the hijacking of mobile phone accounts jumped 200% from 2015 to 2016, as more thieves sought access to intercept one-time security alerts, notifications and passwords. Research by TechChecks finds 81% of people do online banking. Bankrate reports the average fee for using an out of network ATM is $4.57. Fiserv research finds 39% of people say they would have trouble or not be able to pay back a $500 loan. Meanwhile, 47% said that if they received $1,000 unexpectedly they would use the money to repay a debt. Deloitte research finds only 12% of Fortune 500 companies around in 1955 (62Ys ago) are still in business.